This handsome stroller was once, among other things, soft drink bottles. Pretty amazing. It’s heralded as the greenest stroller on the planet, and it just happens to be superbly styled to boot. If you’re keen to reduce your environmental footprint while walking with your baby – this stroller has to be part of your plan. Almost every household in Australia now has access to recycling bins, as part of kerbside rubbish collection. We fill it up, it’s taken away and we don’t think about it again. But innovative companies like Greentom are using our trash to make treasure. The Greentom Upp stroller’s frame is made using recycled plastic (polypropene), and it’s the fabric that is made from recycled soft drink bottles. But that doesn’t mean any compromise when it comes to form and function. The stroller is light (the frame weighs just six kilos) and strong, and Greentom’s new Upp Combination – which includes a Carry Cot, a Classic (forward-facing) and a Reversible seat – is now available in Australia, along with a host of accessories. We’re well known for our love of clever Dutch design at Babyology, and the Greentom Upp is a shining example of how simple often equates to stylish. The range includes the Greentom Upp Combination, which costs $999. It’s basically a three-in-one stroller, with a Carrycot (bassinet), a Reversible seat and a Classic forward-facing option. The Carrycot is perfectly suited to newborns, right through to babies aged six months, then you can switch to the Reversible, which can be used up until about three years of age. The colour combinations reflect the minimalist Dutch styling, with mint, white, blue, black, sand and petrol shades all making an appearance. The enviro-friendly components stretch beyond the frame and fabric, with the Carrycot bassinet housing a bio-degradable mattress. Made from fair trade cotton, Dutch flax and wool, it’s obvious that a huge amount of research and sustainable thinking has gone into every component of this stroller. As well as being beautifully soft, all of the fabrics are washable. With the Carrycot attached, the Greentom Upp weighs around nine kilos – making it easy to manoeuvre and transport. 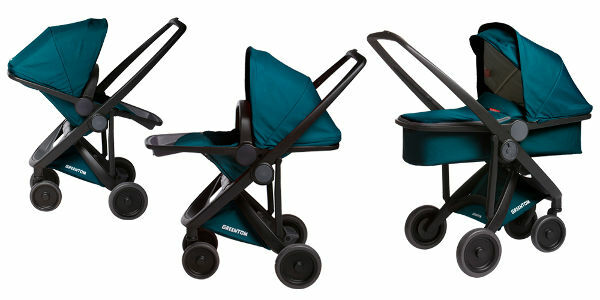 There are also optional car seat adaptors available, to make this stroller an all-in-one travel system. Once your baby is keen to explore the world beyond the stroller, you can switch to the Reversible seat – which can be forward or rearward facing. There are a multitude of reclining positions, so there’s lots of ways to get comfortable. With the Reversible seat attached, the stroller weighs in at a tiny eight and a half kilos. Greentom has also developed the Upp Classic, which retails for $549. Designed for children aged from six months to around four years, or 18 kilos, it also has a car seat adaptor – so with a capsule it can be used for newborns as well. This stroller weighs just over seven kilos, and has a really nifty feature: it can be folded into a freestanding position in just seconds, and the five-point-harness and belly bar ensure kids are kept safe and comfortable. How about its environmental cred? The fabric for each stroller is made from 58 recycled PET bottles and the wheels are made from 100 per cent recycled plastic. They don’t have any screws or joins, making this stroller whisper quiet. The Upp Classic also offers a range of accessories including a rain cover made from high quality see-through plastic (TPU) and recycled soft drink bottles which is PVC free (making it the first green rain cover on the planet). The car seat adaptor brackets are compatible with Maxi Cosi and Nuna Pip car capsules and for the cooler months a warm and snug foot muff is also available. And here’s the final word for the environment – many years down the track, when you no longer need your Greentom Upp – it can be recycled. It’s an environmental winner.